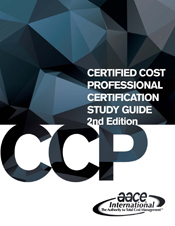 The AACE International CCP Certification Study Guide, 2nd Edition is designed as a companion workbook to the Skills and Knowledge of Cost Engineering, 6th Edition (S&K 6). In conjunction with S&K 6, this study guide will assist individuals in their preparation for the CCP Certification examination as well as develop the general knowledge a cost engineering professional is expected to have. This study guide offers insight into the key topics found in each chapter of S&K 6 and provides practice questions and exercises to better develop knowledge in individual areas. Click HERE to purchase the printed copy of this publication. Below is the link to purchase the downloadable copy.